Defective, counterfeit, out-of-date or obsolete products of all kinds need to be properly disposed of, and TRexShred is up to the task. Get in touch with us today for a custom quote, including door-to-door handling and Certificate of Disposal. A few years back, a fellow Texan tried to increase the profit margin on some plastic flip flops by printing the logo of a certain professional football league on them. They looked much better, but had missed an important step called "licensing." This league is known to be understandably protective of its marketing rights. 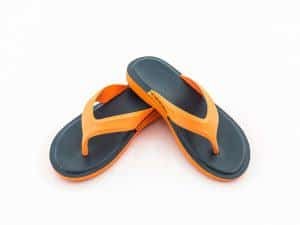 So, as part of a settlement with the flip flop creator and the justice system, TRexShred was called in to ensure that this economically-priced footwear was destroyed and never sold or worn by anyone, anywhere. If you have a case, pallet, or entire shipping container(s) full of products that must be properly and permanently destroyed for any reason, please give us a call at 214-333-3453 today for an all-inclusive quote. Even the top corner of your warehouse with all the spiderwebs is costing you too much to store items you will never sell. So clean it out today and free up space to put the products you wish you had more of for the next busy season. You'll be glad you did! Get the "junk" off your selling floor and website. All that clearance-priced merchandise is doing is driving down the perceived value of your full-price merchandise. You are exposing your cost-of-goods, which makes it that much harder for your customers to say "Yes!" to your full-price merchandise. Get rid of your unsold clearance items today and move on.